Ruby Yun had recently adopted a kitten, but something drew her to look at cats for adoption on Petfinder. There, she saw a story that gripped her heart. 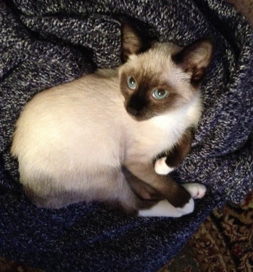 A Siamese kitten named Chai Lai, listed by the Regional Animal Shelter in King William, VA, had been brought to the shelter as a stray with a burned tail, and the injury appeared to have been intentional. The kitty’s tail had to be removed. Peanut has settled into his new home after a terrible ordeal. Ruby called the shelter to get more information and learned that the shelter had posted a fundraiser on its Facebook page to help with Chai Lai’s medical expenses and had an excellent response. Now he was ready for a permanent home. “The next thing I knew,” the Manassas, VA, woman says, “I was driving hours away to visit this kitten and, within an hour of playing with him, decided to adopt him. She changed the tiny kitten’s name to Peanut. “It is amazing how loving and connected he is to people after such a terrible, cruel thing had been done to him,” she says. Pets like Peanut who have suffered abuse have an amazing capacity for forgiveness, fostered by the loving care he received at the shelter and in his new home.